This is the seventh in a series of download DVDs dedicated to tricks and routines using ESP cards. 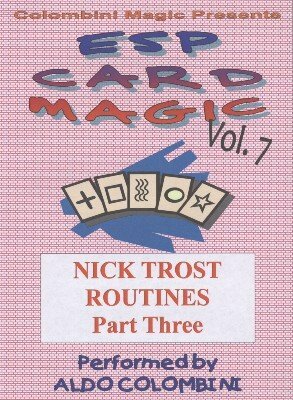 This volume 7 features routines by Nick Trost. FACE-TO-FACE COINCIDENCE: You place three cards on the table and these are inserted into the deck by spectators. They find the same symbols. ESP SWINDLE: A spectator shuffles the deck at random, yet he’s able to pair all the cards (two Circles, two Squares, etc. all the way through). THREE ODD COUPLES: The cards are dealt on the table in pairs and a spectator picks three pairs by placing three coins on them (free choice). These are the only pairs containing two matching cards; all the other pairs do not match. FIVE-WAY COINCIDENCE: A spectator cuts a portion from the deck at random and when these cards are dealt the five Circles (or other symbols) appear. DIE-ABOLICAL PROPHECY: You place a prediction in view. A spectator, using three regular dice finds a symbol in the deck. It matches your prediction. ESP PREDICTION SUPREME: You place three cards on the table. Three numbers given by three spectators find three random cards. They match your three cards. OUIJA MIRACLE: Using two regular dice, a spectator finds two matching pairs from a shuffled deck. ESP COLOR SCHEME: Five Stars and five Circles (or any other signs) are separated by a spectator even though he shuffles them totally under his control. ESP TRIPLE COINCIDENCE: A unique effect! Three cards are selected by a spectator from a red-backed deck and you pick three cards from a blue-backed deck. The three cards are matching.